There’s something about Fall in the air that makes me yearn to break out the candles. It seems I can go all summer without even being tempted, but the first hint of a change in the seasons and I’m on the hunt for new candles to add to the ambience in my home. ILLUME‘s new Indian Summer Modern Naturals Fragrance Collection features warm colors, elegant packaging and incredible fragrances. Illume’s candles are made from an exclusive 100% natural soy, palm and beeswax blend with essential oils. 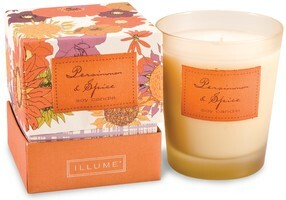 I’ve been burning Persimmon & Spice, a blend of persimmon and fresh pumpkin, nutmeg and clove; a classic Fall fragrance! 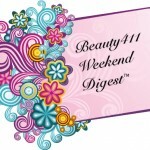 Illume can be found online at www.illumecandles.com and in more than 4,500 specialty retail and department stores internationally. NEST Fragrances by Laura Slatkin has launched the third home fragrance collection called PROJECT ART. Laura developed Project Art for those who desire a significantly higher quality candle at an affordable price. 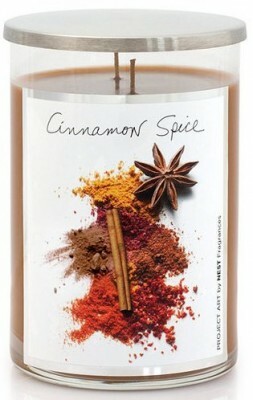 The scents are familiar–from “Pear” to “Pumpkin” to “Cinnamon Spice”, which is the scent I’ve been burning. I like the glass container with it’s modern-looking label. The scent is so homey and inviting–classic autumn. Available soon at Bedbathandbeyond.com, $24.99. 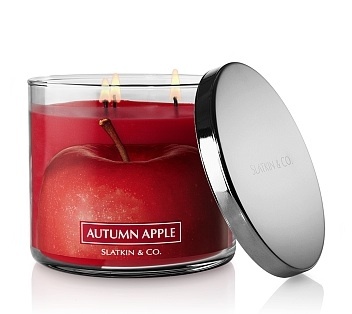 Another amazing seasonal candle is the Autumn Apple candle from Harry Slatkin. This 3-wick candle smells as if you were cutting a crisp, fresh apple open. This candle burned cleanly and when burned as a group with the other candles, sent up the most delicious fragrance. At Bath and Body Works, $19.50. The Tocca Kona candle was designed by Bluemercury founder Marla Malcolm Beck and is a refreshing blend of coconut and hibiscus–an ode to Hawaii. This candle is perfect in a bedroom or bathroom. Tocca is known for their quality candles and this one doesn’t disappoint. Available at Bluemercury.com , $36. 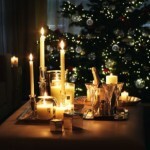 Shining a (Candle)Light on Holiday Hostess Gifts! 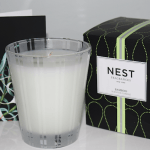 Luxury Scenting and Gifting with NEST Fragrances!